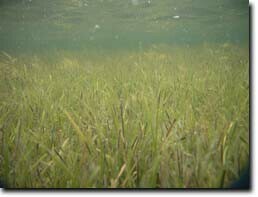 Seagrass meadows are an important marine habitat in Victorian waters. Seagrasses are flowering plants that support highly productive ecosystems and provide food and shelter for a rich assemblage of marine life. Seagrass beds provide critical habitat for adult fish as well as playing an important role as nursery areas for many juvenile fish species. 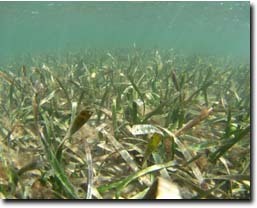 Seagrasses also play an important role in trapping and stabilising fine sediments. The main seagrass species found in Victoria are Heterozostera nigricaulis, Zostera muelleri, Halophila australis, Posidonia australis and Amphibolis antarctica. 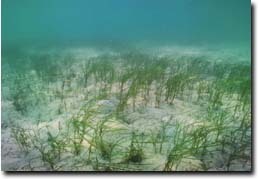 The predominant seagrasses in Victoria’s sheltered bays and inlets are species of Zosteraceae, commonly known as eelgrass. Zostera muelleri typically inhabits the intertidal flats and Heterozostera nigricaulis inhabits the subtidal zone. Corner Inlet is the only Victorian bay where the broad-leaved Posidonia australis is abundant, inhabiting the shallow subtidal zone. Seagrass health is affected by a wide range of natural and human disturbances that occur at a range of spatial and temporal scales. Large seagrass fluctuations have been observed in the past, but limited information has typically been available to quantify these changes or trigger a management response. To assess the status of seagrass across Victoria’s three major embayments, a three year monitoring program was conducted between 2004 and 2007. The project was undertaken by the Fisheries Research Branch (FRB) with a grant from the Natural Heritage Trust. 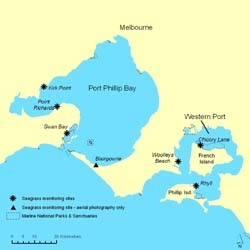 The project investigated seagrasses in Port Phillip Bay, Western Port and Corner Inlet, with three monitoring sites in each bay. 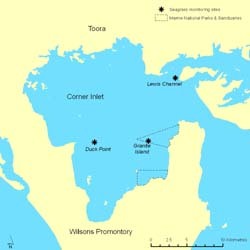 An additional site at Blairgowrie in Port Phillip Bay was monitored by aerial photography interpretation only. The seagrass monitoring investigated changes in seagrass cover, biomass and distribution at different spatial scales. Intertidal and shallow subtidal seagrasses were sampled at fixed points within each of the monitoring sites twice a year (start and end of summer). 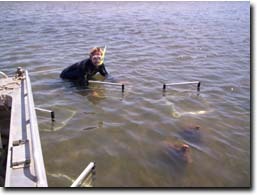 Measurements of seagrass biomass were made in the field and samples were collected for analysis in the laboratory. The seagrass samples were analysed for leaf length, shoot density, epiphytic algae and grazing animals. The role of seagrass seeds in natural regeneration of beds was investigated by measuring seed densities in the sediment. To view these maps provided in PDF format requires the use of a PDF reader. This can be installed for free from the Adobe website (external link). Broad-scale changes in seagrass cover were assessed through interpretation of aerial photography. Aerial photography was flown annually under calm sea conditions and at low-tide to allow seagrass area and distribution to be mapped at the monitoring sites. All mapping and aerial photography interpretation was undertaken with a Geographic Information System (GIS). Ball D., Parry G.D., Heislers S., Blake S., Werner G., Young P., and Coots A. (2010). 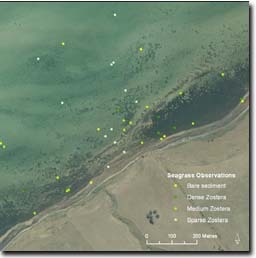 Victorian multi-regional seagrass health assessment 2004–07. Fisheries Victoria Technical Report No.66, 105 pages, Department of Primary Industries Victoria, Queenscliff, Victoria, Australia. This project was funded through a Natural Heritage Trust Statewide project grant. 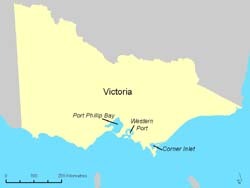 The project was developed with the support of the Port Phillip and Western Port CMA, West Gippsland CMA, the former Department of Sustainability and Environment, Parks Victoria and the Environment Protection Authority.